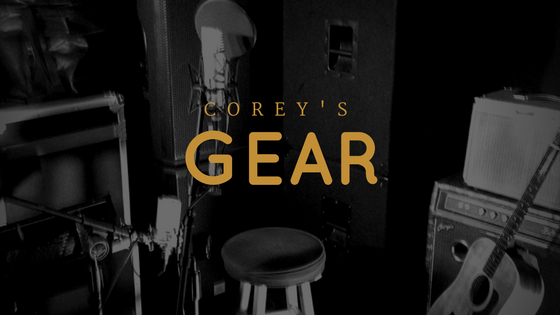 Wondering what Corey’s uses for guitars? Wondering which microphones he uses to record or when he performs live? Or how about the service this website is hosted on? You’ve come to the right place. If not, look anyway. You might find something cool. Taylor 200 Series – 210SE – I walked into Daves Guitar shop in La Crosse, WI. I asked what guitar would sound the best both plugged in and unplugged. The dude working the counter pointed to the wall of Taylors. I played everything from $700 to $2000 range and this is the one I settled on. This ax has been grinding it out with me for about 4 years now and it sounds better today than the day I bought it. Washburn D10SCE – This was the guitar I used for many of my early gigs, open jams and every tune on my Never Too Late album. Now it is my main back up. I was never crazy about the plugged in sound but unplugged I sounds great. And for the price, it was a perfect guitar to start out with. Genz Benz Shenandoah – I go direct many times for smaller gigs because I’m lazy and i don’t like to carry around a lot of gear. But when I’m playing with band, I plug in to this amp. I love the way this mic makes me voice sound. Crisp and clean. Deep and rich. We did have some feedback issues when I used it with the band. My sound guys hated it. I never had a problem at smaller solo or duo gigs. This is the mic my sound guys recommend I get for band gigs. Totally eliminated our feedback issues. It sounded good but I always feel like it is missing something. It is the first mic I owned. This mic is legendary and recommended by many. If you are starting out this is the mic you want. You can get them without the on off switch but I like having it for between sets or when I’m not on stage. I mainly record demo’s in my studio. I leave the heavy lifting to the studio I work with. BUT the gear I use was recommended by that studio. The gear below has really improved the quality of my demos. Here are the best piece of my gear. Focusrite Scarlett 2i2 Audio Interface – This device helps me get the sound from my mouth or my instrument into the computer in the quickest, cleanest way possible. It came very highly recommend and I haven’t had any issues with it in the 4 years I’ve had it. Rode NT1-A Cardoid Condenser Microphone – Not only is this a solid mic for vocals but the NT1-A makes my acoustic guitar sound pristine on recordings. Only thing that would make my guitar sound better is using two of them at the same time. Great dual purpose mic for a pretty reasonable cost. Heil PR-40 Dynamic Studio Recording Microphone – I use this mic for podcasting and for all the audio on any desktop recorded videos tutorial videos that I record. This mic was recommended to me by the Podcast Answer Man Cliff Ravenscraft. I always thought that if you want people to take you serious, you gotta sound good. I love the way it makes my voice sound and I get a lot of compliments. Sennheiser HD 212Pro Headphones – This exact model is discontinued but they are awesome. But I think it is pretty safe bet that newer model Sennheiser is offering are just as awesome. Managing a music career is about more that writing, recording and performing. There is a ton of stuff on the business side you have to do to get the word out. Click the link below to visit my music marketing website to see all of the software and services I use to I use to manage and promote my music.